There is no doubt that Ubud has a spiritual energy. The smell of incense offered outside temples and altars. The face of devotion, dignity and dedication, in the eyes of the Balinese. The green, lush surroundings of rice fields, palm trees, rivers and waterfalls. 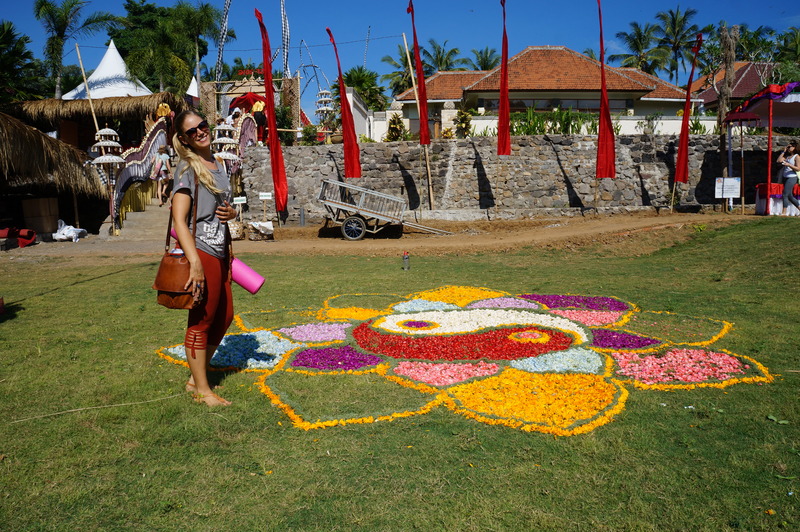 The open-minded and heart-centered expat community that call Ubud home. 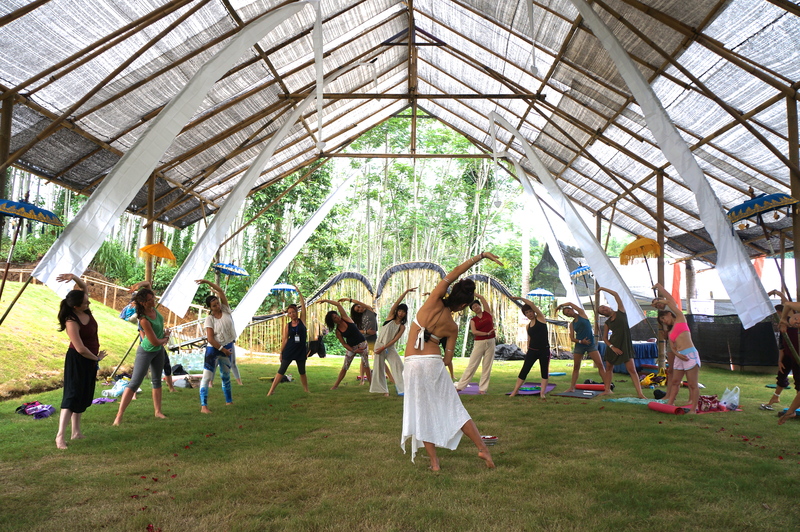 Take that and add a festival with international yoga gurus, spiritual healers, holy priestesses and conscious self-development coaches, mindfulness and meditation practitioners, philosophers and authors, shamans, martial arts masters, breathe-workers, world musicians and dancers, dreamers and ecstatic dance DJ’s. 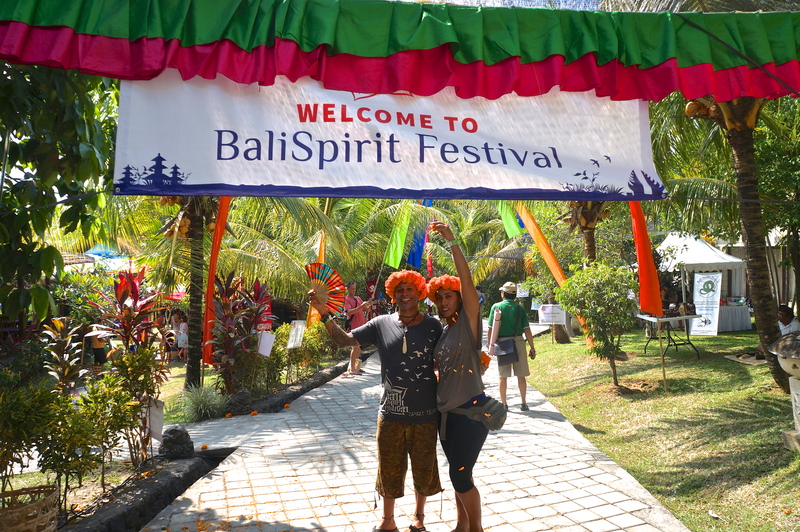 The Bali Spirit Festival is really something else! For the 9th year, people from all over the world came together for a 5 days and nights celebration! And I am still at the loss of words for what I experienced. However, I feel the need to try, from my little corner of the extraordinary tapestry of events. I was a part of the Spirit Team, volunteering as a Presenter’s Liaison. My task was to make sure my five assigned presenters were provided what they needed for their workshop and had the necessary information and support during the festival. At the opening evening party I met up with four of my five presenters: The Chinese Tai Chi master, the Japanese/Balinese Bhakti dancer, the French Tantric yogi and the American Happiness Coach. The only one missing was the Australian ‘Law of Attraction’ facilitator. Even after the first day of the festival, I had not yet met this (by then) mystery woman. I had been up since 6 am, making sure my first presenter got to the festival alright. I had arranged rose petals, cushions, whiteboards and pens and attended some of my presenters classes. I had connected with so many people and my head was buzzing, when I decided to finish off the day with a coconut in the restaurant, before getting on my scooter home. I spotted this lady also sitting by herself in the restaurant. She looked strangely familiar and I suddenly realized that it was my final presenter. I walked over to introduce myself, at the same time as her giant pot of tea came in. 1,5 hours later we had covered topics such as synchronicity, skin rashes and spiritual encounters with Indian gurus. And how the Law of Attraction was the invisible compass on the treasure hunt map called Life, guiding us from one place to the other, setting us up with the right people at the right time, unravelling everything and nothing, making the whole human experience a mystery. I rode home with a huge smile on my face. A smile that lasted all throughout the week. 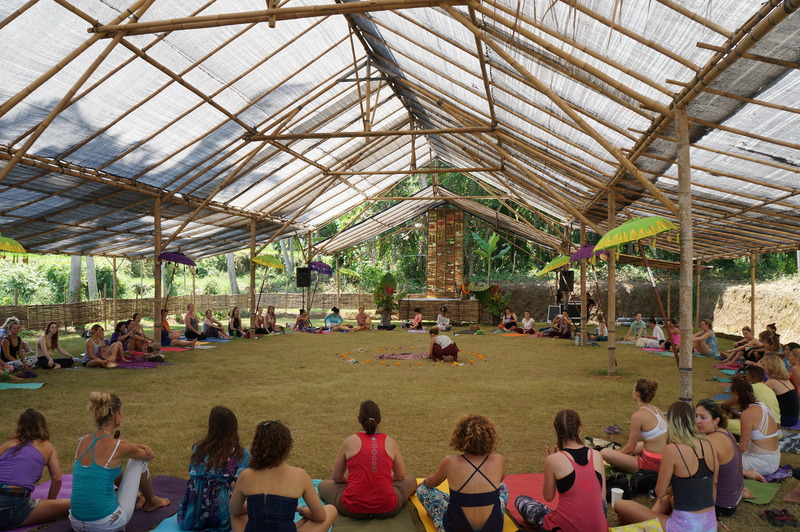 It’s impossible to say what was the highlight of the week for me, but I can definitely see a pattern in how I mostly found myself at Women’s workshops, diving into topics such as sacred femininity, sensuality, liberating dance, relationships, empowered storytelling, happiness and self love. I connected with amazing facilitators and healers and challenged myself in so many ways, but what stuck out was the Law of Attraction encounter with Deborah Langley, and how I couldn’t stop smiling throughout her workshop, trying to keep up with notes, insights and ideas that were pouring in. And how all the magic of the festival: all the music, the food, the smiles, movement and meditation, hugs, tears and laughter, all came together on the final evening party. To be at the beautiful evening venue, with two of the three girlfriends that are staying with me now in Ubud, and bumping into Deborah. A piece of the past blending into the present; dancing, laughing and enjoying like you only do when you know that a certain moment will never come again. Suddenly, she was pulled away by the organizer of the festival and off into the crowds she went with a wave and a knowing that we will meet, when the time is right, again. As my dreams are aligning with my experience, I am remembering the magic that life holds, with every breath. The more I exhale and let go, the lighter I become. So I can easily be blown away by the magic that surrounds me.